All my David Eddings Reviews. The Belgariad and the Mallorean are some of my favorite books, I tend to re-read them every other year or so, and they are just as enjoyable the 10th time as the first. 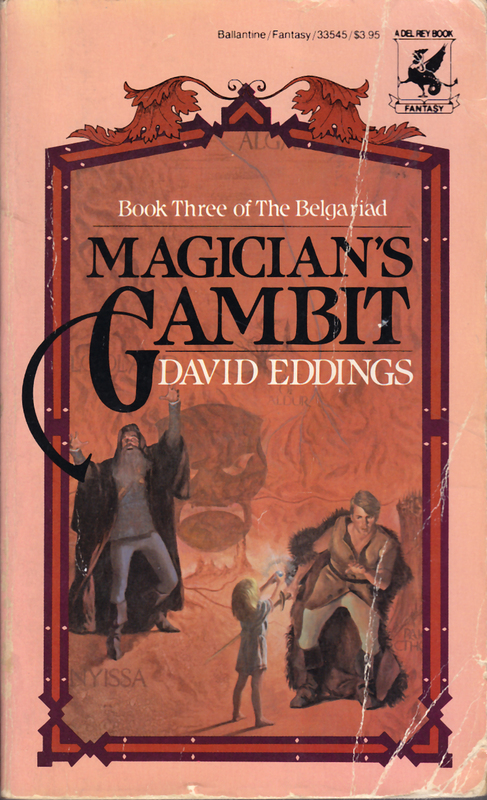 The difference between these books, and others that would be classified as High Fantasy is that David Eddings sticks to humans and Gods--no elves or dwarves or anything like that, which gives these books a different flavor than others. I love his characters, and his dialogue truly makes the books, each character has a distinct personality, which is what sets these books apart from the masses of fantasy books published each year. I was given a used copy of The Belgariad series in college as part of a gift exchange where I worked. 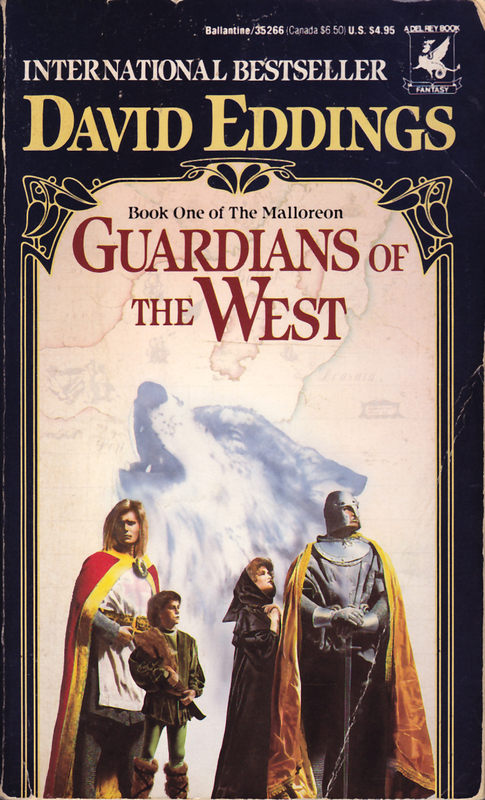 This was the series that returned me to being a reader and got me back into reading fantasy, which I hadn’t done since I was much younger. My copy of Pawn of Prophecy is worn and a little ragged–despite the fact I purchased the entire series new again after loaning my books to someone who never returned them. The corners of the pages are somewhat rounded, from the book being carried around and shoved into various bags and pockets from many readings. For a long time this series was my primary escape when life got ugly and things got tough. Then I started branching out and reading more, and returning less and less frequently to this series, until I realized the other day I hadn’t read The Belgariad since before we bought our house, which was eight years ago. 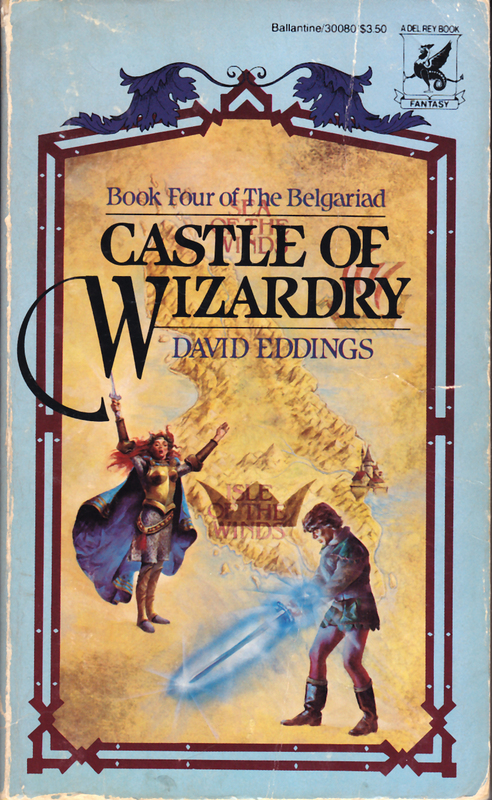 So to mourn the recent death of David Eddings, I decided to pick up one of my all time favorite series, and try and read it slowly, to savor the story. 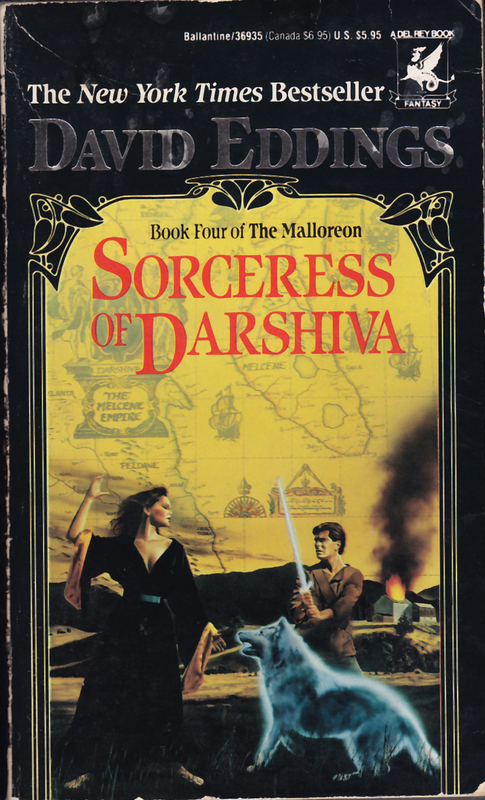 Yes, sometimes David Eddings writing was over the top. But first and foremost it’s fun. I love these books: I love the story, I love the characters, and I love how–no matter how many times I read them–I frequently laugh out loud while reading. 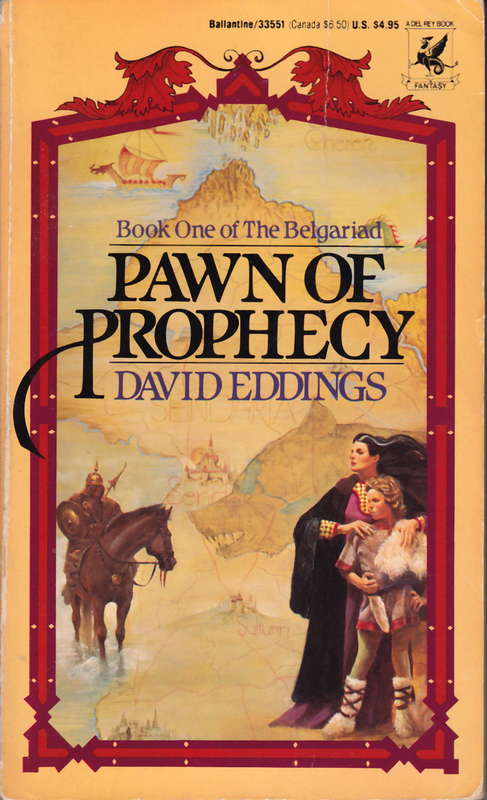 Pawn of Prophecy is the first book of the Belgariad. It is the story of Garion, a small boy who lives with his Aunt Pol, who is the cook at Faldor’s farm. For all the rest of his life he had a special warm feeling for kitchens and those peculiar sounds and smells that seemed somehow to combine into a bustling seriousness that had to do with love and food and comfort and security and, above all, home. This is a story that unwinds slowly and lovingly, spending time with the characters, and seeing how Garion became who he did. “Always do the very best job you can,” he said on another occasion as he put a last few finishing touches with a file on the metal parts of a wagon tongue he was repairing. We spend time getting to know the characters and the land in depth. But the reason I snatched this book up when I saw it was on sale as ebook was because I wanted to spend time with Silk. “And also a thief and a spy,” Barak rumbled good-naturedly. Silk is far and away my favorite character. As much as the story may be about Garion, I love spending time with Silk. Don’t get me wrong, I love most of the other characters as well, but Silk is a perfect rogue, and I adore rogues. Oh, the eBook cover is very different from the original cover, but it’s boring, while the original cover is beautiful and gives you a perfect feel for the book without giving anything away. It’s been awhile since I read this book, and I was afraid that time might have changed how I feel about it, but I sank right into the story, comforted by the familiar words and characters. I think what I love best about Pawn of Prophecy is that Garion is young, and the mistakes he make are those someone his age inevitably makes–you may realize before he does that he is doing something stupid, but you’re your caught up in the story and how Garion feels so what he does makes perfect sense to him, and to you. But of course it’s the secondary characters that truly make this series. As much as I love seeing Garion grow up, I love reading about Silk’s exploits even more. I love to read about thieves and scoundrels, because they’re so much fun, and Silk is probably my all time favorite scoundrel. Of course the down side is this is a five book series, followed by a second five book series. But of course I’ve read these books so many times I can stop reading them at any point in time–I just don’t want to because I’m having to much fun. If you want an epic fantasy with snappy dialog and a good story, this old favorite is one I can recommend again and again. The cover is coming off my copy of the second book of the Belgariad, Queen of Sorcery. As with the previous book, the spine is bent and the corners are rounded, but like the first book it’s from multiple readings and being carried around and shoved into pockets and backpacks so I could read at spare moments and escape whatever it was that was bothering me. Garion has now come to terms with the fact that his aunt is Polgara the Sorceress and the man Aunt Pol called Old Wolf is none other than her father, Belgarath the Sorcerer. The are on the trail of the thief Zedar, who has stolen the Orb of Aldur. As they travel through Arendia, others join their group–an Asturian and a Mimbrate. Although I don’t mind either, they aren’t my favorites. Silk remains my favorite, although his banter with Barak places him in a close third, after, of course, Polgara. We also start to learn about the world in which they live, and see the difference between the various regions. “Documents are easily forged,” the knight declared. “So they are,” the Tolnedran agreed, “but to save time I make it a practice to accept all documents at face value. (T)he richly robed and cowled priests of Chaldan, the Arendish God, chanted an age-old hymn that had much to do with war and vengeance, but little to do with comfort. Of course one of the things I love best is the language. I know people who’s lives should become a burden and an affliction. This isn’t my favorite book in the series, but so much of import happens here, it’s still tremendously enjoyable. It’s quite interesting to read this book after so much time away. As is the case with many epic fantasies, the place of women in the world is quite often as second to that of men, although considering the time this book was written, I think it does a fairly good job of allowing women participation in governance and decision-making, and it gets better as the series progresses (and coincidentally, the state of women in the real world changed as the series was being written). The revenge he had wanted so desperately for the past several months was dreadfully complete, but the taste of it was bitter, bitter. Then his knees buckled and he sank to the earth and wept like a broken-hearted child. There is so much about this passage (and of course the story that surrounds it) that I absolutely love. Garion must come to terms with his actions, he does not–and cannot–take a life and brush it off lightly. And his moral uncertainty is much needed as his older companions (with one large exception) are able to kill at need and move on without thought to the consequences. I like the humanity we see here, and the recognition that despite everything, the taking of a life is not something to be easily brushed off without consideration. The third book in the Belgariad has never been my favorite. This book starts with Ce’Nedra’s point of view, and I just never really got Ce’Nedra and always found her annoying. Doesn’t mean the book isn’t good, just that I’m not a fan of Ce’Nedra’s or of reading her point of view. Of course the book does switch back to Garion’s point of view, and it is interesting to see Garion from Ce’Nedra’s point of view. But. She is a spoiled brat. The third book of the Belgariad opens with one of my favorite “outside the story” bits, which is how the Ulgos came to worship UL. The story feels as if it could have come out of the Torah. It’s beautiful and moving, how the Gorim came to convince UL to become the god of the Ulgos. There’s lots of theology throughout the story, and although some of it is horrible (see: Torak) much is beautiful. “You see, Garion,” Wolf explained, “the ultimate purpose of the universe is to create things. It will not permit you to come along behind it uncreating all the things it went to so much trouble to create in the first place. It’s a very elegant explanation of why magic works in certain ways, and I quite like it. We also meet Relg, who is a very problematic character. As Garion had feared, Relg’s favorite topic was sin. Garion was amazed at the simple things that Relg considered sinful. Forgetting to pray before a meal, for example, was a major transgression. As the fanatic’s gloomy catalogue of his faults expanded, Garion began to perceive that most of his sins were sins of thought rather than of action. Relg is a zealot, and his obsession with religion is somewhat horrifying, but it’s also very well done. We see why Relg is the way he is, what caused him to become so, and we slowly see his transformation. Now Belgrath and Silk have rejoined the group, they’re going to the Vale of Aldur, at Aldur’s request. We also add new characters even as others are left behind. Although it’s not exciting per se, I like watching Garion grow and develop his powers, because that is one thing this series does well: explain how talents and skills are developed. Garion starts out a child with few skills, and through the journey he has learned to read, learned the Drasnian secret language, learned how to fight (still needs some work there), and started down the road to becoming and sorcerer. We get to see him take his first unsuccessful steps, and then see him improve from there. The book also has the fight between Silk and Brill, which is something that has been a long time coming. Again, the story allows ideas to be introduced and slowly build, never feeling forced. Yeah, it’s not exciting necessarily, but showing us–even if only in small pieces–how he learns does two things: it shows us the passing of time and it shows us that even gifts must be developed with work. What is interesting is it seems like the series should be over now: they recovered the Orb, and yes they have to get home, but that was the goal developed in the first book. But there are two books left, so you know more has to happen, and we’ve been given plenty of hints that the world has more in store for Garion even if he doesn’t realize all the implications of what he has to do. 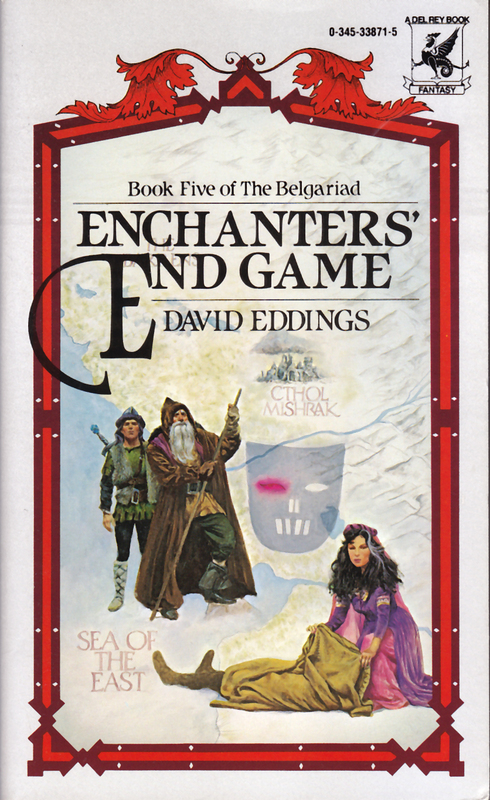 The fourth book in David Edding’s Belgariad finds Garion and the rest of the company returning to Riva. Belgarath has collapsed from exhaustion, and events conspire to place Garion in command of the group. We also see him quickly developing his skills with the Will and the World, as well as the result of the work he has done as they have traveled. Although this is a good book, it’s not one of my favorites, and there are things that bother me about this story, primarily Ce’Nedra. It’s possible she could be more of a brat, but it’s hard to say how. Luckily, she recovers quickly, so you don’t spend too much time being annoyed with her. Book four of the Belgariad finds Garion and his companions with the Orb, and needing to make their way back to safety. We discover who Garion really is, and what the future has in store for him. “My body doesn’t bother me, but it bothers you very much, doesn’t it? But is the wickedness in my mind or yours? I can sink you in sin any time I want to. All I have to do is this.” And she pulled open the front of her dress. Relg spun about, making strangled noises. “Don’t you want to look, Relg?” she mocked him as he fled. “You have a formidable weapon there, Taiba,” Silk congratulated her. And there are some more lovely little bits about the Ulgos. Reading this 20-some years later, I find the passages like this far more interesting than I did the first time I read them. It’s a fascinating theology. But my favorite bits come halfway through, when Garion and Belgarath and Silk go off. “What do they want?” Garion asked. “Breakfast, obviously,” Silk answered, still holding his sword. I adore Silk the longer the series goes on. And by the Mallorean, he’s hands down my favorite character. Now it’s been a very long time since I read this book for the first time, but most of the events are not going to be much of a surprise to you, but it hardly matters, because it’s Garion’s surprise that is most important. I can easily believe that he did not know what was going on–and why should he have? The other part I very much like is the time Garion spends with Adara. Garion’s relationship with her is very important, and something I think he desperately needed, especially after having spent so much time in the company of adults. This is also the book where Ce’Nedra comes into her own and grows up a great deal. I never forget how irritating she can be, but I love the reminder of how much more she is than her childish manipulations. I also love the little bits and pieces dropped throughout the series, such as Lammar and Denton and the boy with the flute and how the keep popping up again and again, giving us glimpses as to what life is like. Yes, it’s the fourth book of a five book series, so there are events that have to happen, but for the most part, they are events I enjoy watching unfold. The Belgariad concludes with Enchanters’ Endgame. Here we find Garion and Belgarath and Silk in Gar og Nadrak, which is one of the most fascinating places in his world building. The Nadraks don’t much care for their god, and have a disconcerting take on women, but unlike the Murgos, are fascinating (so, as we later discover, are the Maloreans) but the Nadraks are far more interesting. “Because she gets half,” Silk shrugged. “She gets half of the money every time she’s sold?” Garion was incredulous. Vella is yet another marvelous character, and I love that we see spend time with her in the Mallorean. And Silk and Yarblek are perfect partners. We also get to spend time with the various queens, who are in charge of their kingdoms while their husbands are away at war. One of the other things I adore about this series is how dreadful and dreary war is. Terrible things happen, but also, they tried very hard to make things realistic. Quite suddenly, to everyone’s astonishment, King Fulrach of Sendaria became the absolute commander of the host. It was he who decided how far they would march each day, when they would rest and where they would set up each night’s encampment. His authority derived directly from the fact that the supply wagons were his. And then there’s Torak. One of the things I like is how Torak as repeatedly described as “mad” rather than evil. In some ways, there isn’t a lot of difference between the two, but in others, we see repeatedly the wish for redemption. And it is a fascinating thought–the idea of what would happen if a God were to suffer from madness. But not only is it fun to see them travel through Gar Og Nadrak, I quite like the Nadraks. The Murgos are quite horrible, and the Thulls are idiots, so it was nice to see at least some of the Angaraks not be completely horrible. And I do like the parallels drawn between the Nadraks and the Drasnians. Silk is one of the best characters in the series, so those parallels do a good deal make the Nadraks seem decent–even though that’s in comparison to their Murgo and Thull brethren. Although she’s better, I’m still not enamored of Ce’Nedra. Yes, she does learn responsibility, and yes those lessons come at a price, but I still find her annoying. Cute just ain’t all that. One of the strange things about this book is I’d almost forgotten it ended without the Epilogue. Yes, we needed to know all that stuff, but it takes a very strong ending and kinda wanders around and meanders and although it does tie up loose ends, it’s one of the weakest parts of the story. But at least it was made into an Epilogue. I’ll close with some notes about the formatting of the eBook. It’s terrible. There were many many typos and errs that come from OCR not quite being as good as it could be. Some of the typos were rather irritating (especially those that were repeated). But every time I found a typo, I used the kindle to note it and send it along, so hopefully future editions will be cleaner. Was the series everything I remembered? No, but it didn’t need to be. It’s comfort reading, and a lot of fun. 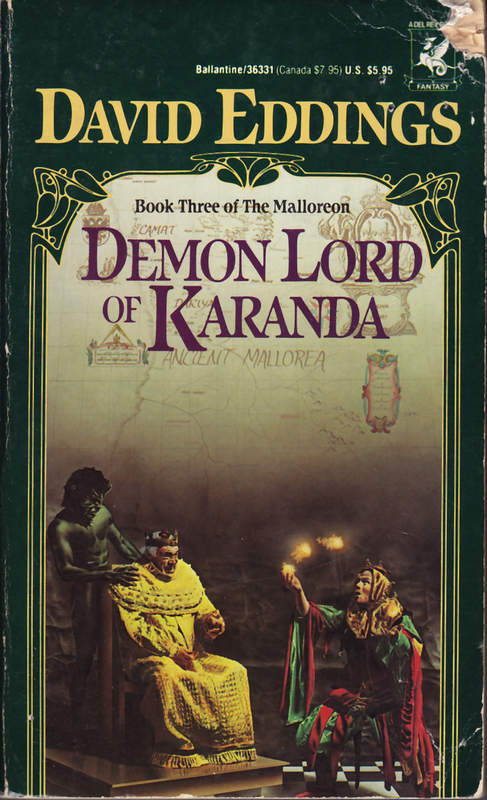 The first book of the Mallorean covers the years following the events of the final book of the Belgariad. Errand, Polgara and Durnik move into Poledra’s cottage–after Belgarath helps them repair it–and we get to see some of Errand’s youth. Ce’Nedra and Garion have problems (not that this should come as a surprise) and eventually Ce’Nedra has their long awaited first child. Like the previous series, there is a lot of background. Not necessarily world building, but rather lovely little vignettes of the lives of the various characters. This book has one of my favorite passages in it. Somehow it always happened that way. The moment anything was broken, spilled, or tipped over , someone in authority would appear. There was never an opportunity to tidy up, and so such situations always presented themselves in the worst possible light. The double doors at the far end of the ballroom opened, and Polgara, regally beautiful in blue velvet, stepped inside. Her face was grave as she regarded the guilty-looking pair lying at the foot of the stairs in their piles of cushions, with a positive blizzard of goose down swirling around them. Errand winced and held his breath. Very softly, she closed the doors behind her and walked slowly toward them, her heels sounding ominously loud on the marble floor. She looked at the denuded chairs lining each side of the ballroom. She looked at the marble balustrades. She looked at the two boys with feathers settling on them. And then, without any warning whatsoever, she began to laugh, a rich, warm, vibrant laugh that absolutely filled the empty hall. Errand felt somehow betrayed by her reaction. He and Kheva had gone out of their way to get themselves into trouble, and all she did was laugh about it. There was no scolding, no acid commentary, nothing but laughter. He definitely felt that this levity was out of place, an indication that she was not taking this thing as seriously as she ought. He felt a trifle bitter about the whole thing. He had earned the scolding she was denying him. ‘You boys will clean it up, won’t you?’ she asked them. ‘Splendid, your Highness,’ she said, the corners of her mouth still twitching. ‘Do try to gather up all of the feathers.’ And she turned and walked out of the ballroom, leaving the faint echo of her laughter hovering in the air behind her. This is not a book where things move at a fast pace with adventure on every page. But it is an absolute delight, coming across passages like that. 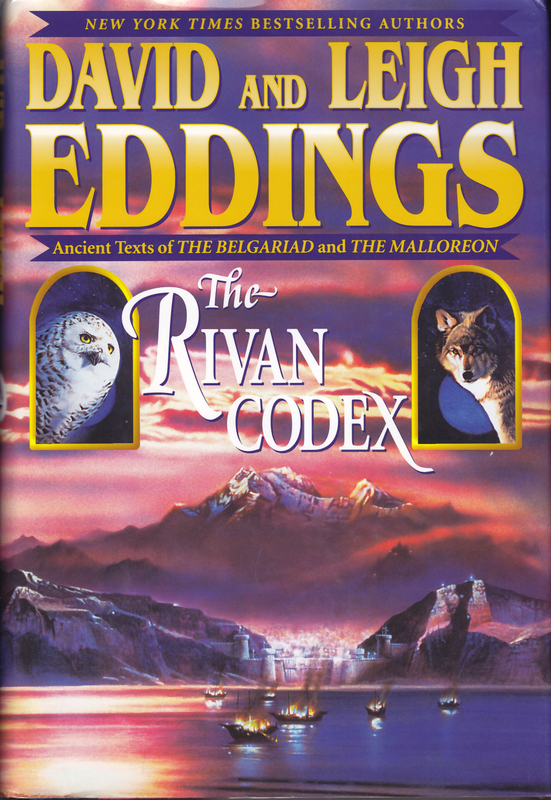 And it is also, I think, we were see the hand of Leigh Eddings (who was listed as co-author in later books). I think also, we see her in the return of Vella, my second favorite character after Silk. ‘I am the Queen of Riva,’ Ce’Nedra replied, drawing herself up to her full height. One other thing: who on earth are the people on the cover? Because they don’t resemble any characters from the book as far as I can tell. 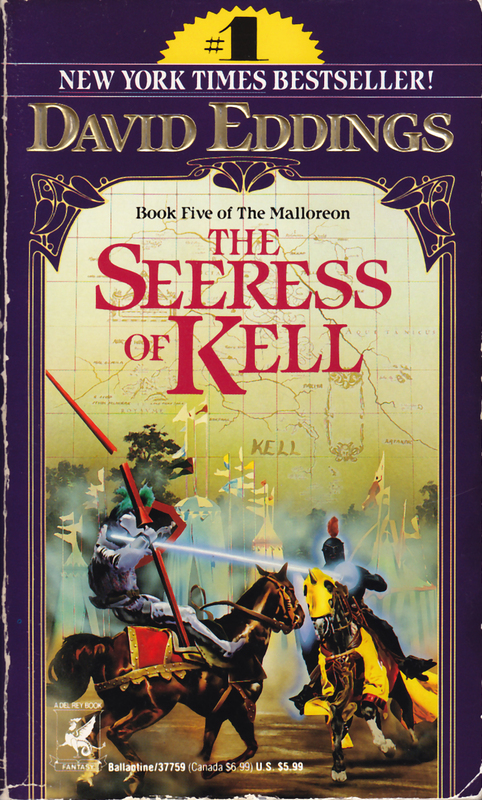 The second book of the Mallorean finds Belgarion once again on the road with companions (including my favorite, Silk) but not all those who went on the first quest are allowed on this one, which causes some grief, and will come up again in later books. And we pick up some new people, including another of my favorite characters, Velvet. ‘His Excellency, Prince Khaldon, Ambassador of the Royal Court of Drasnia,’ Morin announced, ‘and her Ladyship, the Margravine Liselle, a— uh—’ He faltered. ‘Spy, your Excellency,’ Liselle supplied with aplomb. This book (and the rest of the series, really) is mostly travel, but despite the demons and other unpleasantness, it’s still a comforting read. It’s also where we start to see the author beginning to humanize the Murgos. As Garion was a child in the first book, it made a kind of sense for him to see things in black and white. But I appreciate the complexity that is given to the Angaraks in this series, as well as what it portends for the rest of the series. In the second book they travel again through Nyissa, and meet again with Salmissra, and travel through Cythol Murgos, where they meet King Urgit. I like Urgit–I don’t find him the slightest bit believable, but I like him. As much as I enjoy that part of the story, I have a hard time accepting Urgit as presented. Essentially, it’s fun, but I’m not sure fun makes it right. I also like the developing relationship between Velvet and Silk. You can see what’s coming, even if Silk doesn’t, and it is amusing. Ce’Nedra is far more subdued, and you do have to feel sorry for her, especially since she isn’t being annoying. I like continuing to watch Garion mature. There is a particular scene as they travel through Cythol Murgos that has always stuck with me. Garion’s reaction to the deserters and their treatment of the Murgo farmers is very striking. 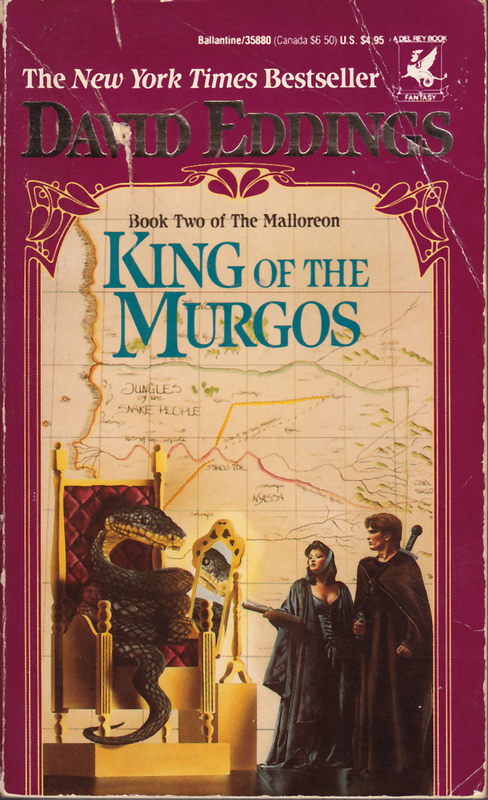 The first series Garion spends thinking of Murgos as evil and somewhat less than human. Now he spends time in Cythol Murgos and sees Morgos as individuals instead of as a monstrous race. The third book of the Mallorean finds our heroes meeting Zakath, the emperor of all Mallorea. As with Urgit, the meeting has unexpected results, and again, Garion discovers that the Anagraks are not all he was expecting. Brador cleared his throat, fought for a moment with one of Zakath’s ferocious kittens for the long pointer he wanted to use, and began. We also meet Feldegast, who was traveling with with Vella and Yarblek. He’s another character I quite enjoy. And of course the best parts are the banter. That’s the funny thing about this series. As a whole, I don’t like the story nearly as much as I like the first series, the Belgariad. Yet, this series has some of my favorite characters and favorite scenes, so even though the story as a whole isn’t my favorite, these books have far more scenes that stick in my memory than the first series. Of course there are also scenes I could just as well do without–the trouble Silk, Sadi, and Liselle get into in Mal Zeth has always struck me as faintly ridiculous–and I’m not sure how I feel about Garion allowing Sadi to create havoc unmonitored. But for the most part, the scenes I love, and the dialog I love, more than make up for the parts of the story I don’t like as well. Garion and company are continuing to move through Mallorea, and trying to avoid Urvon and Zandramas while figuring out where they need to go next. This isn’t particularly one of my favorite of his book, but there are still fun parts, such as their meeting with Senji. That idea absolutely delights me–not just that they’d decide to kill someone to determine if he was immortal, but that it took them 300 years to realize that possibility. They spend time in Melcenea, where they discover not just where Zandramas has been and what she’s been doing, but also where they need to go next. And they get to meet back up with Zakath. Interestingly, although the story is almost all travel and few exciting events (although the conclusion is exciting) it still has some of my favorite quotes. “That doesn’t seem very practical,” Durnik said disapprovingly. And then there’s my all time favorite quote. In the next to last book of the series, we learn a lot, and they travel far, and there’s lots of fun dialog, but they’re not necessarily exciting events. But that’s perfectly fine with me. The fifth book of the Mallorean and the tenth book about Belgarion finishes his story. 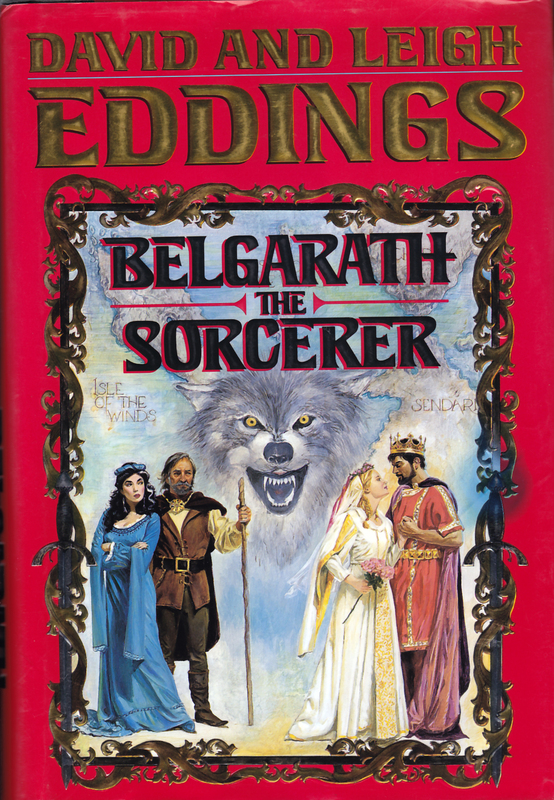 Although David Eddings wrote three more books set in this world, they were books about the past–telling the stories of how Belgarath and Polgara became who they were. This books closes the story on Belgarion and Ce’Nedra. Interestingly, like the Belgarion, the final chapters are more like an epilogue, and that is, I think, part of the weakness of this series. 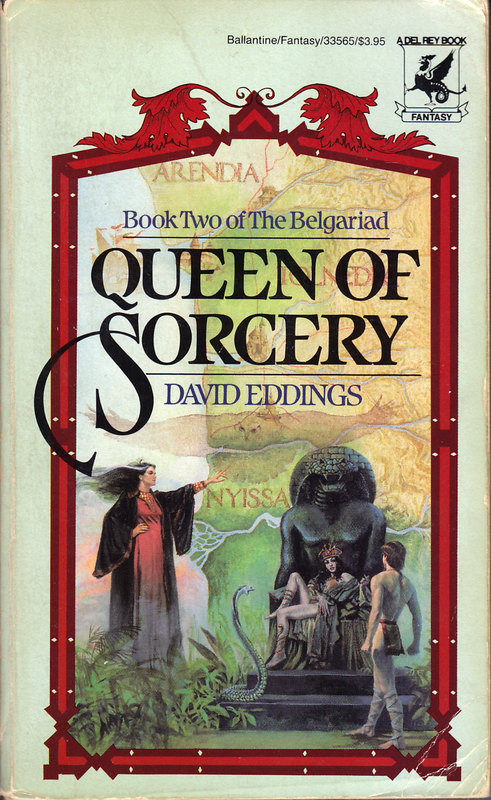 The last 75 or so pages are rather anti-climatic as David Eddings wraps up almost all of the loose ends. It’s nice to know how things turn out, but as I said, it’s rather anti-climatic in comparison to the events preceding. So you end the book with a good happy feeling, but things have all but completely wound down by that point and it somewhat feels like the author was tidying everything up rather than story telling. The conclusion of the Mallorean is a lovely wrap-up, but that also makes it somewhat frustrating. All the ‘i’s are dotted and ‘t’s crossed and everyone who wasn’t already married and in love ends up so by the end of the book. That’s not to mean there aren’t lots of lovely passages. There was an abiding peace here, a peace that washed away the turmoil and anxiety that had beset them all on the plains below and somehow erased care and even thought. Each turn and each ridge top brought new vistas, each filled with more splendor than the last until they could only ride in silence and wonder. The works of man shrank into insignificance here. Man would never, could never, touch these eternal mountains. That’s how I feel about the mountains too. But there are–besides all the happily-ever-afters some things that frustrate me about this book. First and foremost is the actions of Barak and the others. Barak and Mandorallen I can see haring off to Mallorea, regardless of what they’ve been told. But Hettar? Far less likely, and I really don’t see Relg buying into it. I get that they were needed for other matters in the story, but that little bit of sleight of hand has always bothered me. If you have not read the Belgariad and the Mallorean, I highly recommend them. However, recognize that they are epic fantasy, and if you pick up the first book, you’re in for a ten book series. 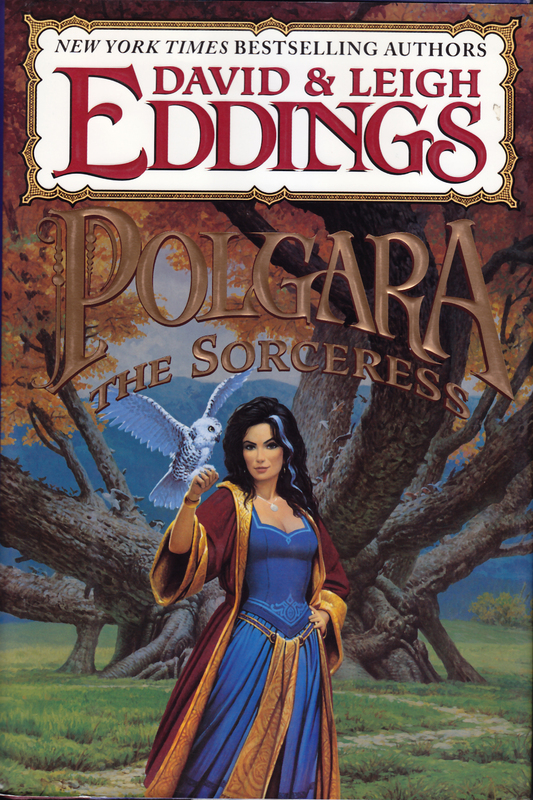 I also recommend this Del Rey site for Polgara the Sorceress.